In this life you must find your own door and walk through it. In this life, before you practiced Reality Transurfing you were sold the idea that you needed to persist, overcome obstacles, compete and never give up. You believed life to be a struggle. But as a Transurfer, you realize that fulfillment comes to you as you move toward your goal by walking through your own door. That means paying attention to the comfort level of your Soul. Imagine that everything on your “Have List” has already been reached, it’s all behind you now. Do you feel very good or do you feel bad? If you feel very good looking at this on your own mind movie, then you have found your door and you will carry on walking through it as a person who obeys the laws of Transurfing. 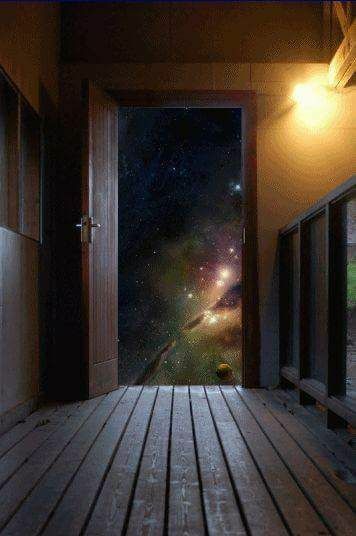 If you don’t feel very good looking at this, then it’s not your door and you still need to find it. When you find (The Thing) that will give your life real meaning, then your goal also matches your door. But the Pendulum then said “You’ll never get that, so forget it!” and you obeyed. It’s time to bring that to an end, shut it down and become more like your true Self (what you love most in life), you do not know “HOW” but your Soul will find the way. Keep asking “How would this goal feel if I already had it?” If your Soul has a “That’s It!” reaction to your visualized slide, then you've found your door. If not, ask your Soul to point you there and be a good listener. Never, let your mind start putting up obstacles to what your Soul says is your true door, the place where you really belong. You are looking for something that will end up turning your life into an every day celebration of Gratitude Joy and Fulfillment.